edgeNEXUS Application Firewall is an appliance that protects a Web application by controlling its input and output and the access to and from the application by inspecting the HTTP conversation between the application and clients according to a set of rules. These rules cover common attacks such as cross-site scripting (XSS), SQL injection, session hijacking and buffer overflows which network firewalls and intrusion detection systems are often not capable of doing. The rules may be also used to enforce security policies required by PCI DSS or other security standards in order to block leakage of sensitive information like credit card numbers. 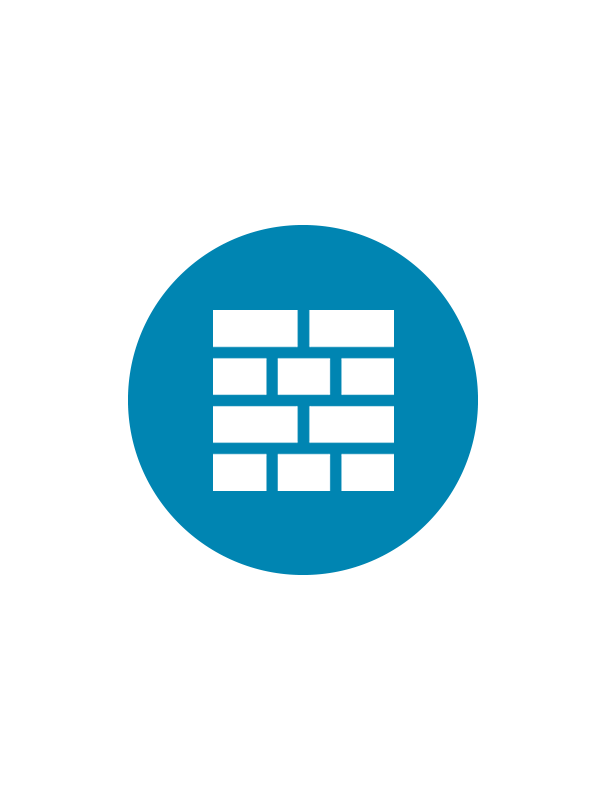 By customizing the rules to your application, many attacks can be identified and blocked. The effort to perform this customization can be significant and needs to be maintained as the application is modified. Deploy edgeNEXUS Application Firewall from the Library → Apps → Add-Ons section of jetNEXUS ALB GUI, then navigate to Services → Add-Ons section of jetNEXUS ALB GUI. 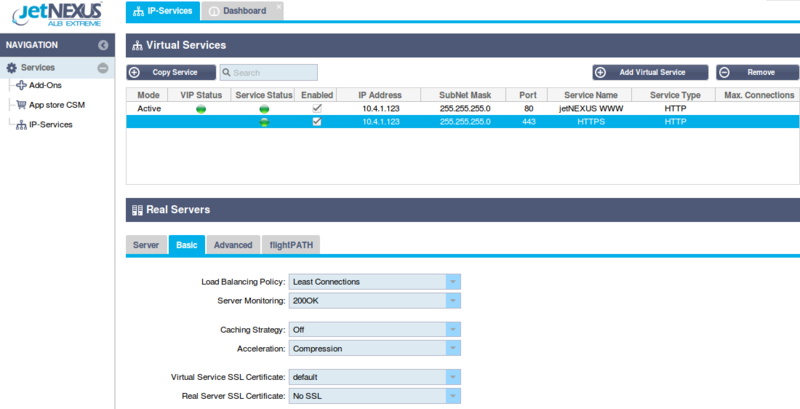 Locate your newly deployed Add-On, give it a name and an External IP address, then press the Run button. Once the Add-on is started you may press the Add-On GUI button, which will open edgeNEXUS Application Firewall GUI in a new browser tab. When you open the browser tab with edgeNEXUS Application Firewall GUI you will see a log in prompt. Please type in user name “admin” and password “jetnexus” for your first log in. You will be able to change the login credentials as well as create new users in the Management → Users section of edgeNEXUS Application Firewall GUI later. After having logged in you will see a home page of edgeNEXUS Application Firewall GUI. The home page displays a graphical overview of the events, i.e. 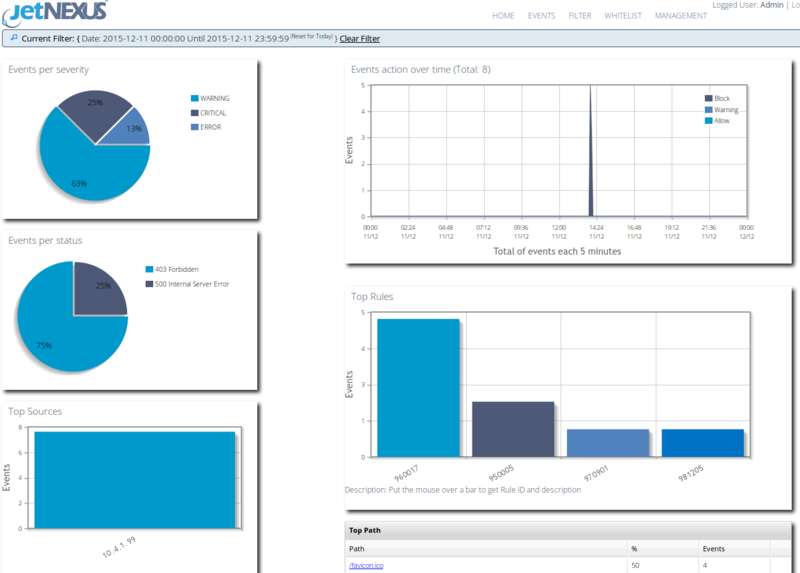 filtering actions performed by the Application Firewall. The graphs will be very likely blank when you first open it as there were no any access attempts through the Application Firewall. 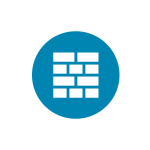 In order to define the domain that must be protected by the Application Firewall please navigate to the Management → Config section of edgeNEXUS Application Firewall GUI. Type in the domain name to be protected, for example “www.jetnexus.com” and press “Save” button. Open jetNEXUS ALB GUI and navigate to Services → IP-Services, then create a Virtual Service by specifying an IP address, network mask, port number – 80 and service type – HTTP. Then define a Real Server by specifying its address and port number. Please put the container name as defined in the Add-Ons section of jetNEXUS ALB GUI in the Real Server address field. Then open the Basic tab and choose Server Monitoring: 200OK. Setting up a HTTPS Virtual Service is very similar to HTTP, the difference is that the Virtual Service port number is 443 for HTTPS and a Virtual Service SSL Certificate must be chosen in the Basic tab. When firewall blocks an application resource, the rule that is blocking traffic, appears in the Blocking Rules list on the Whitelist page of edgeNEXUS Application Firewall GUI. In order to prevent the firewall from blocking the valid application resource, please move the blocking rule to the Whitelisted Rules list, then press “Update configuration” button. edgeNEXUS Application Firewall will update its effective rule set and the whitelisted rules will not block traffic any more. Please try accessing the protected application again to verify that no other rule is blocking access. edgeNEXUS Application Firewall rules can be updated by installing edgeNEXUS WAF OWASP CRS software update. edgeNEXUS Application Firewall will automatically detect updated rule set, load and apply it. The IDs of whitelisted rules will be kept, however new rules may start blocking valid application resources. Please check the Blocking Rules list on the Whitelist page in this case.